Αναδημοσιεύουμε από εδώ μια «έρευνα» σχετικά με το ποια είναι, γιατί εξεγείρονται και τι θέλουν τα άτομα που λαμβάνουν μέρος στις συγκρούσεις με τις δυνάμεις καταστολής στο Κίεβο. Αν και ερασιτεχνική, η «έρευνα» αυτή είναι ενδεικτική της σύνθεσης του κόσμου που συμμετέχει ενεργά στην εξέγερση. A Sociological Survey With the Purpose of Finding Out Which Social Layers Are the Militant Force of the Modern Revolution in Ukraine? Our assumption has been that in Ukraine we have a revolution combined with counter-revolution. The counterrevolutionaries are the 3 pseudo-leaders – Oleh Tyahnibok of “Svoboda”, Vitaly Kitcko of “Udar” and Arseniy Yatsenuk of “Bat�kivschina”. They struggle with the government of Yanukovich and the Party of Regions for redistribution of the state power, and, hence, redistribution of the former state property (for, you see, in Ukraine and other similar “transitional states”, possession of state power opens the door to grabbing of the state property!). Revolutionaries are those who do not belong to any party, who are by themselves at the barricades and who fight the cops. The official “opposition” and “Maidan” (Maidan refers to the main square in Kiev, Ukraine, where in the winter of 2013-14 there are major anti-government protests and clashes with the police) are two different and even contradictory concepts. 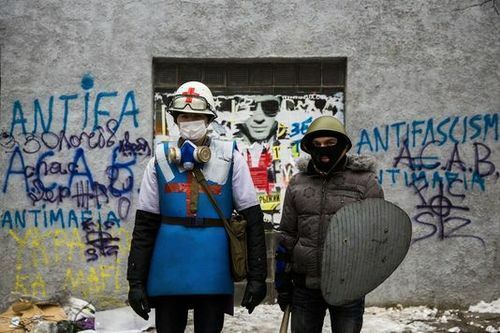 We’re faced with the question: who is the moving force of the revolution in Ukraine today? Who is really manning the barricades and performs other militant functions on the Maidan? To answer these questions we have conducted a sociological survey. We have questioned those who were manning the barricades at the entrance to Maidan from the direction of TsUM (the Central Universal Store, which used to be the main department store in Kiev, located on the main street of the city, Khreschatik). We have surveyed the militants along the Maidan, the guards at the entrance to the Ukrainian House (taken over by the rebels), and especially at the barricades on the Hrushevskogo Street (which was the epicenter of clashes). In the course of one day, 15 February, 2014, we have managed to survey 37 people, while some of the participants have given an extended oral interview, for which I am grateful to them. 1. Education: 1) didn’t finish school, 2) finished high school, 3) technical 2-year college, 4) incomplete higher education, 5) higher education. 4. How do you understand the main problems now facing Ukraine? (The main problems of the society). 5. How can these problems be solved? (The ideal final result. The innermost desire for the future of this society). 1. Higher education, an agriculturalist. Current occupation � a driver (hence: doesn’t work according to his education, but as a simple worker). Desires to be an entrepreneur. The main problem of the society is corruption. Solution � “death to Yanukovich”. 6. 2-year technical college education, profession is a tractor-driver. Discussed the situation in Ukraine orally, in the sense that the militia extort money from him. 7. Studied to a 2-year technical college to become a train driver, current occupation: a builder, makes the facade (hence, doesn’t work according to his education). The main problem is a large corruption and nepotism. Solution: a complete change of government, lifting off the deputies’ immunity. 9. Higher education, an engineer. Now is an entrepreneur, however, doesn’t make enough money. After Maidan is over want to leave for Europe. Thinks that it is necessary to take power from the oligarchs. Solution lies in an agreement with Europe. 10. 2-year technical college education, manager in computer typesetting. Before the Maidan he was a student. After the Maidan intends to continue to study to get a higher education. 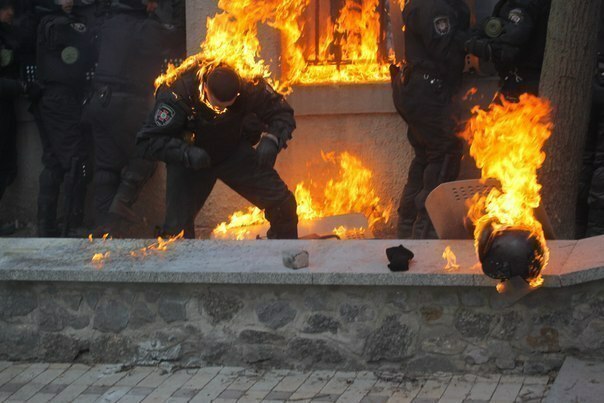 The problem of Ukraine is that the current government is criminal. (This is what I mean when I write about mafia). Solution: resignation of V. Yanukovich. 11. Higher education, an engineer in the sphere of wood processing. Before Maidan worked as a worker-builder. Used to be an entrepreneur – owned a bakery, a number stores, a cafe. After Maidan intends to be involved in “reforms in Ukraine”, build civil society and possibly come back to entrepreneurship. Main problems are lawlessness and absence of rights, no justice. To the question of what it means, he replied: “Those who are guilty are not responsible for their crimes”. Such example as deputies running their cars over people, after which there are no criminal cases against them, is sufficient. Solution lies in a change of the system of government and reforms. 12. 2-year technical college education. Profession: a workshop teacher at school. After Maidan intends to continue with social activism. The main problem of the country is “government”. In order to resolve the problem, everything needs to be changed and the politicians need to work for people. 13. High school education. A workshop teacher at school. After Maidan intends to continue with social activism. Main problems are injustice towards the people and bribes. Solution lies in the method of Maidan, i.e. to stand on the main square of the city to the end, have new elections, new government. 15. Higher education, a French language translator and a lawyer, was involved in translations at courts. The main problem is mafia at power. It breaks up into a number of clans. It is against the small and middle-sized business. It is necessary to split the Party of Regions (the ruling party in Ukraine), to break up the power of mafia, to adopt the 2004 Constitution, to take power from the President. 16. Higher technical education. Second education in philology. Noticed that the Soviet-era education was higher than the current one. Works as entrepreneur in the sphere of wood processing. Wants to be involved in alternative energy, such as wind turbines. The main problem of Ukraine is people who do not have any faith or principles. The solution lies in self-education. 17. Finished 2-year technical college. Used to be an entrepreneur, a builder. Will continue working as the same. Main problem is total corruption, a state of lawlessness, a carte blanche for the officials. Solution is in a change of government, a system with European values. 18. Higher technical education. An entrepreneur in the building sphere. Also involved in extracurricular education and enlightenment for kids and adults. The main problem is in upbringing of people. We need to have a wider view of the world. This can be developed through Maidan, for example, he solved a problem facing a man who was regulating the traffic of cars through the barricades, made the post more safe by telling people to put sand bags around it. 19. Finished 2-year technical college, a car mechanic and a driver. Works at a car service and installs a video equipment. “The main problem is government!”. Solution: “To change the world view! To start with oneself! To help others. Work to all”. 20. Higher education in commerce. Second education in pharmaceuticals. Before Maidan used to be climber-builder, and a small entrepreneur. Afterward intends to get married and life a quite life. The main problem is that aliens and irresponsible people rule the country. Solution is a compromise with power for “there is no ideal”. We need a democracy. 21. A student of a military college. Involved in computer programming and Web design. Wants to finish the college and become a regular officer. The problem is incorrect policy of the leaders of the country. They don’t hear the people. Solution is in choosing the leadership from among the people. 22. 2-year technical college education, driver, electrician. Works as an electrician and as a security guard. The problems are: “disbelief in God, pauper’s lifestyle, a habit of being a slave, absence of solidarity. Solution – if someone has fallen, to try to raise him, no matter what social class he is from”. We don’t need a Central Election Commission, people can form the laws directly by themselves. For a direct democracy. 23.) Higher education, an economist. Before Maidan a builder and a musician (rap). Gangsters and liars, cardsharpers and swineheds have come to power. And their godfather is leading us to an abyss. For now he is not stealing the furhats, but millions. A gangster and a former cardsharper – that is the essence of our power. But our “educated” “anarchists” and “Trotskyists” have their own theories about “bourgeoisie” ruling this country. But let’s come to the respondent #23. After Maidan, he wants to do music. The main problem is power, gangsters. Solution: their overthrow, one law for all. 24. Education: 2-year technical college. Used to work as a welder. After Maidan wants to get married. The problem is Yanukovich, Azarov, Arbuzov, “communists” (note: he means that the current ruling caste is a direct sequel to the regime of the Communist Party of the Soviet Union. And he is more correct than those who talk about “bourgeois” state and hence “bourgeoisie” as a ruling class). Solution of the problem is to overthrow the power. 25. Education: 2-year technical college, diploma of a car mechanic and a welder. Used to work as a welder at a factory and will continue doing the same. First, we need to overthrow the old government. 26. Higher education. Used to be a director in a state organization related to transportation. Now is retired, pensioner. It is necessary to get rid of the criminal gang, to create a possibility for a future for the people. And only the people can do it. 27. Higher education, diploma of a gym teacher. Worked as a foreman at a steel factory. The main problem is lawlessness, the laws are not working, the government officials go unpunished, they can do all they want. Solution is overthrowing the powers that be. New power must be in the interests of the people. The laws must work. 28. 2-year technical college education. Worked as a driver and a welder, and will continue doing that. The problem is government which sells us out (“pigs”). Workers don’t have work. Solution: to destroy – either they destroy us, or we destroy them. 29. Graduated a 2-year technical college. Used to work at a cemetery, digging graves, burying people. Against compromises. A member of “Self-defense” unit, called “Leo”. 30. Finished a 2-year technical college. A worker, used to do home renovations. Wants “happiness in the family”. Problem: the government doesn’t fulfill its promises. We need to install a new President who will first think about the welfare of the people, not his own pocket. He is also a member of “Self-defense” unit called “A Wild Hundred”. They are not under anybody’s command. 32. Higher education, a sound engineer, an artist designer. Intends to bring up a baby daughter. The problem is indifference to totalitarianism. The solution should be radical and aggressive, for there is no other way to deal with the current regime. (Who offers radical, aggressive solutions to the problems of today’s Ukraine, Russian, etc.? 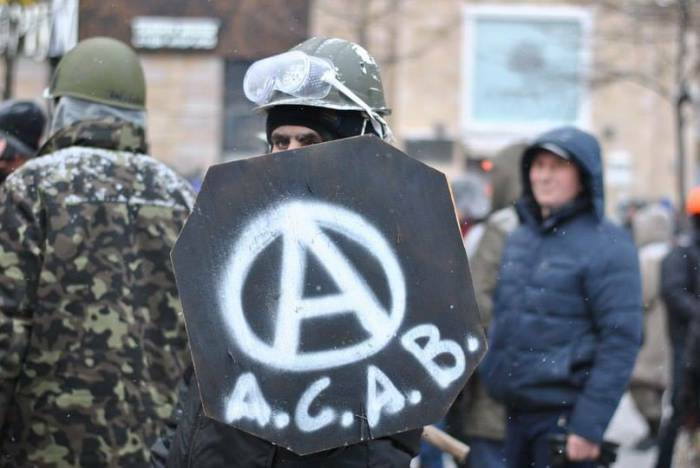 Anarchists? Trotskyists? No. I see only the nationalists, such as Korchinsky, see his book “A War Inside the Crowd”, or his last interview from exile. That is the reason why the nationalists are increasing in strength, while the pseudo-revolutionaries remain only a sect.) The respondent finished his survey with the phrase: “to become self-conscious”. 33. High school education. Works as a mime. The problem is dictatorship. Solution: a complete change of government and some laws. 34. 2-year technical college and incomplete higher education. Worked as a car mechanic and intends doing the same. Demands a resignation of the President. 36. High school education. A welder. Intends to continue working in the field. He is against war, for justice, for life without bribes. 37. A student of an agricultural Institute. Major is “mechanisms of agricultural machinery”. Wants to finish the Institute and find appropriate work. The main problem of Ukraine is its government, which does everything for itself, and nothing for the people. The solution lies in the change of government. In addition, one of the respondents pointed to the problems of organization at Maidan. For example, “Spil�na Sprava” collects money from the people, but its activists do not know where the money goes. There is not transparency. At some places the barricades are left unmanned, even though on Maidan there are plenty of young people in helmets. The leaders of the squads lack experience. The approaches to Maidan are not guarded. 1. Most of the people on the barricades are workers (24 out of 37 respondents). The second largest category are small, or former entrepreneurs (7 out of 37 respondents). The third place is occupied by “white collar” workers (4 out of 37). And the last place is taken up by students (2 out of 37). 2. Workers often act under the directions of more intelligent students, or entrepreneurs, or managers of state organizations. The students and entrepreneurs can speak and write more intelligently. It is those who in the Soviet times were referred to as “intelligentsia”. 3. The nature of power in this country is a synthesis of corrupt officials acting on concert with gangsters. They are the direct descendants of the Soviet era “nomenclature”. That is why we have such actions as overthrowing the statue of Lenin. This is a symbolic action signifying a desire to overthrow the totalitarian rule of the former “nomenclature”. The problem in the country has gone so far as to demand a radical and aggressive solution. That’s why the parties which offer the most aggressive and radical methods will grow. While the organizations which mumble can call themselves “workers” and “revolutionary”, but will continue to remain insignificant sects. This entry was posted in ΝΕΑ ΑΠΟ ΤΟ ΜΕΤΩΠΟ and tagged ΚΑΤΑΣΤΟΛΗ, ΚΡΑΤΟΣ, ΟΥΚΡΑΝΙΑ, ΤΑΡΑΧΕΣ on February 20, 2014 by simeioseis.